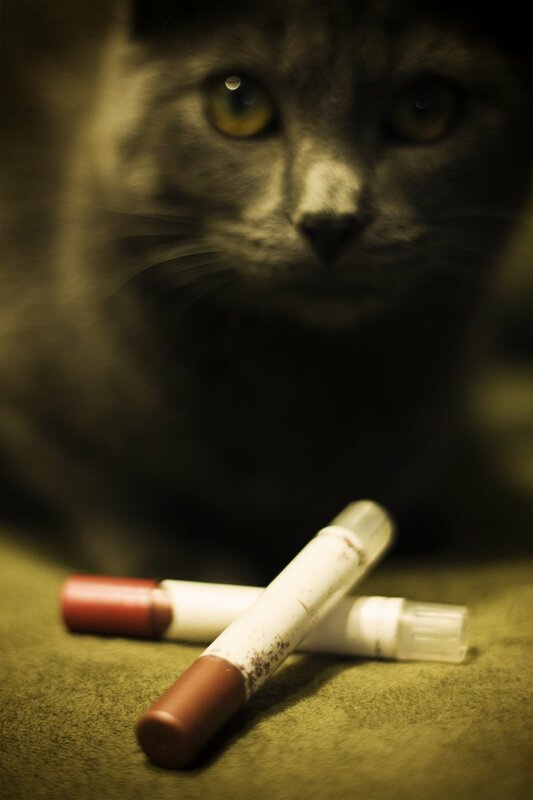 Waiting for a homemade lip balm to set up is a little like developing a Polaroid. You stand there and watch. And then you touch. And then you curse, because it wasn’t quite dry and you screwed up the pristine look. And then you watch. And touch. And do it all over again two more times. So my first recommendation when making your own homemade lip balm: Pour it in your container and walk away. Seriously. Walk away. And don’t look back for 3 hours. These are the three homemade lip balm recipes that I’ve enjoyed the most over the past couple of years. One is made with lavender essential oil, one has a main ingredient of coconut oil, and the last … well, it’s peppermint-chocolatey goodness. Now, with all these recipes, you can substitute whatever essential oils you have on hand (or prefer). So, for instance, this recipe calls for lavender essential oil: Feel free to leave it out completely or substitute it with a soothing essential oil like rose, sweet orange, chamomile, vanilla, or carrot seed. 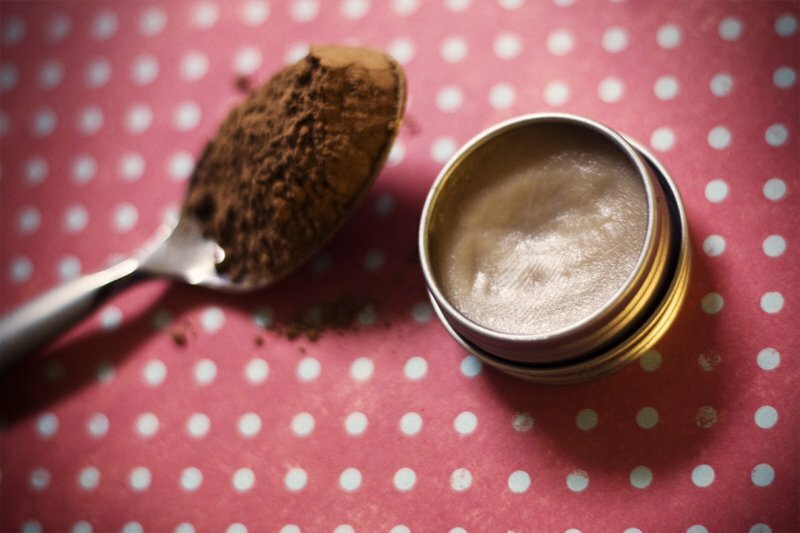 This recipe uses honey, which gives the balm a heavenly taste. Just be careful not to lick your lips TOO much. That’ll just dry ’em out, which just so happens to be the opposite of what we’re going for here. Note: This lip balm is relatively soft, but I think it would hold up just fine if you wanted to pour it in a clean lip balm tube. 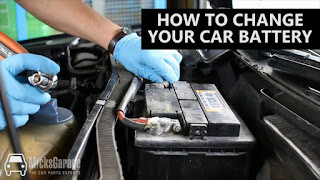 Just be sure to clean the old balm out well (unless you get your hands on brand new, never used lip balm tubes somewhere) and sterilize the tube in boiling water for a few minutes. Warm the oils, beeswax and honey in a small, stainless steel pot or bowl. Be sure to warm it on VERY low heat. (You can use a double boiler, if you’d like.) Stir until the beeswax is completely melted. Remove from heat and quickly whisk in the essential oil, vitamin E, cocoa powder, and colored lipstick. Place the bottom of the bowl into a shallow pan of ice water and continue whisking quickly as you add the honey. 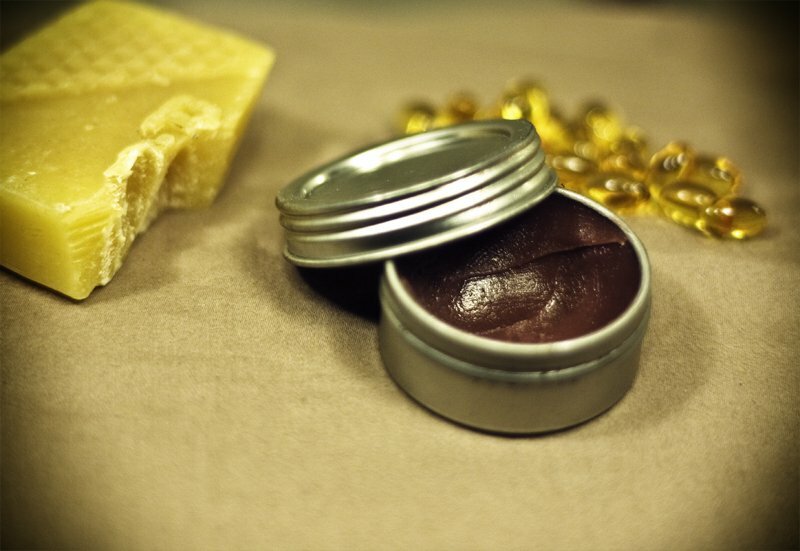 Once the honey is incorporated, quickly transfer the balm into your lip balm container (tube or tin) and allow to set for 3 hours. As you can see, my lavender lip balm is kind of a dark aubergine color. It actually turns out a very light mauve when I use it on my lips. I don’t particularly think the color is necessary, but it gives the lip balm a little fun twist. If you recognize the tube shape, then maybe you’ll know. It might have been Kiss My Face, but I’m not 100% sure. The guy who sold them to me last year at the little store looked like Santa, though, if that helps. I made this for a second time tonight, because I had the itch to experiment. Before, I didn’t bother with “other” ingredients. It was just coconut oil, cocoa butter, and vitamin E. This time, I wondered what would happen if I steeped some rose petals in the oil for a while before finishing the balm. It was lovely! Roses, in particular, are super soothing. But you could use any kind of dried herb or flowers you’d like. You know what else? This is a PERFECT lip balm for this time of year. The cocoa butter and rose is so very reminiscent of Valentine’s Day. Make it as a gift to your hubby or significant other. Only you’re the one wearing it. Catch my drift? One more thing about this particular lip balm! 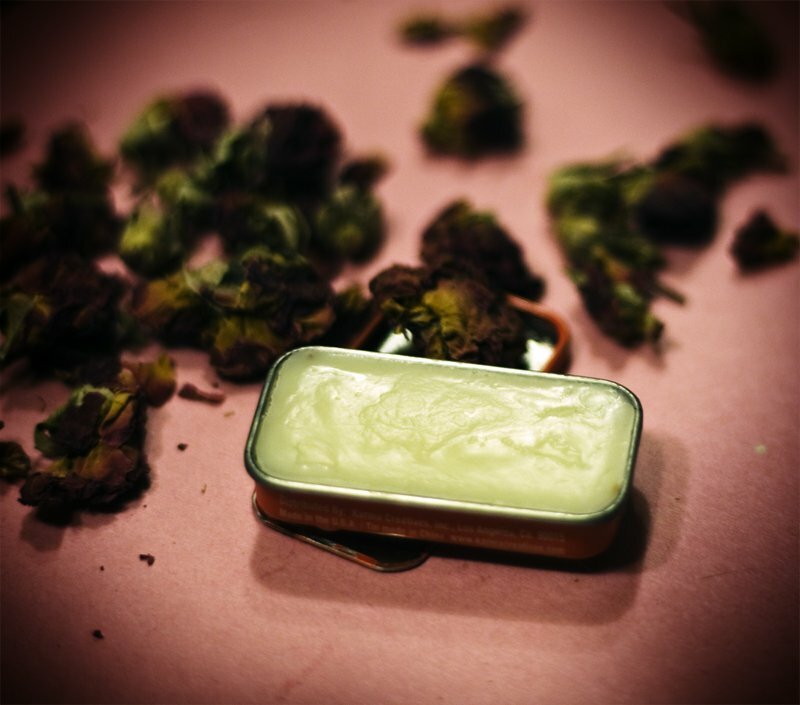 Any lip balm you make can be used as a hand salve, too, but this one, in particular, makes a fabulous moisturizer for any part of your body. I had a bunch left over, and I immediately coaxed Fiance into giving me a foot rub. On very low heat, melt the coconut oil in a small stainless steel bowl or pot. After the oil is liquid, add your roses (or other dried flowers) and stir well. Allow to steep (again, on very low heat) for 1 hour. Strain oil into a bowl through a fine-mesh sieve or cheesecloth. Wipe out your original heating pot/bowl, pour oil back in, and return to heat. Add cocoa butter and stir until melted. Remove from heat, add vitamin E oil and essential oil and stir well. Transfer to a small container and let set for 3 hours (or until completely set). Note: Because this is predominately coconut oil, DO NOT put this in a lip balm tube, and do not keep it in your pocket. Coconut oil liquefies rapidly with just a small amount of heat, and if you keep it somewhere warm (like next to your hot little body), it’ll leak all over. This super fun (and very firm) lip balm is adapted from this recipe at From Nature With Love. I made it last year for Christmas for the chicas in my family. And then I kept 3 tins for myself. However, of all the recipes I’ve given here, this one lends itself VERY well to being more of a “tube” lip balm. It’s very firm and almost a little difficult to apply from a tin. It takes some patience to rub your fingers around it until it’s soft enough to transfer to your lips. Surprisingly, the cocoa powder doesn’t give it much color at all. It turns out a very light tan hue. However, the smell with the mint is out of this world. Place the shea and cocoa butters in a small pot or double boiler, and add the coconut oil. Heat over VERY low heat for 20 minutes, stirring occasionally. (Try not to let the mixture go over 175 degrees, or the shea butter could end up a little gritty.) Add the beeswax and stir well. After the beeswax has completely melted, remove the mixture from the heat and add the essential oil, honey, vitamin E, and cocoa powder, whisking well the whole time. 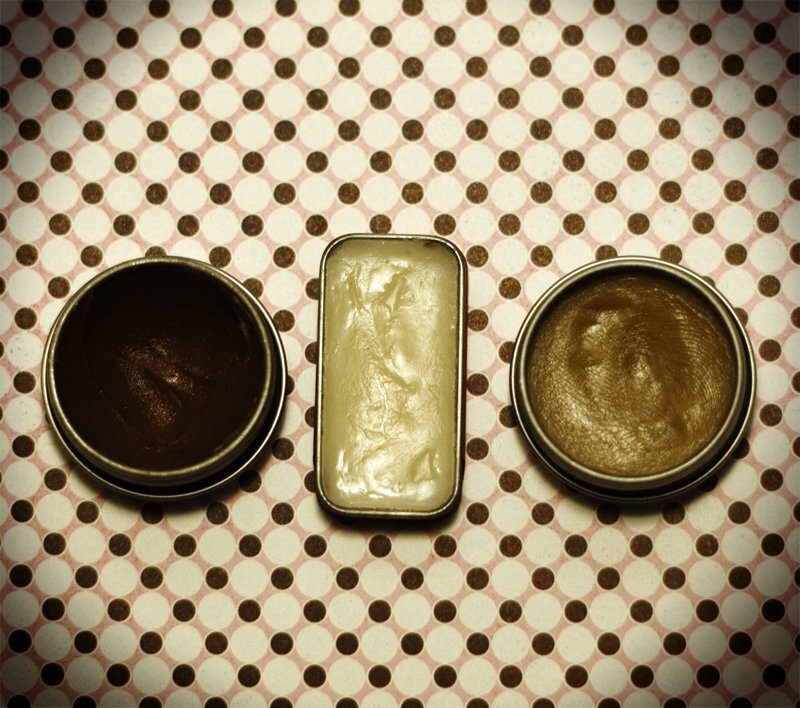 After everything is incorporated and smooth, transfer to a lip balm tube or tin and allow to set for 3 hours.